Which Premier of South Australia challenged a fellow Member of Parliament to a duel with revolvers in Victoria Square? Who was the first woman police constable in the British Empire? What were the origins of firms such as Faulding's, Holden's, Penfold's, and Wendt's? Who invented the stump-jump plough, the stripper, the pedal wireless? 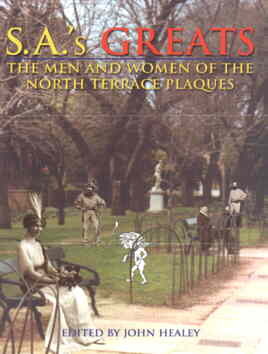 SA's Greats features concise, illustrated biographies of the 169 eminent South Australians commemorated by plaques on the footpath of North Terrace, Adelaide. Here are the inspiring stories of explorers, inventors, industrialists, social reformers, parliamentarians, scientists, writers, artists and sporting figures --- the men and women who have enriched our culture and improved our way of life. Each one page biography contains a summary of the person's life, career, interests and major achievements, together with insights into their character and their legacies to South Australia. Ninety-five historians and researchers have contributed entries to the book. The illustrations, many of which have never beenpublished before, comprise both photographs and artworks. SA's Greats is published in softcover at a recommended retail price of $11.95. It has 200 pages and 168 black and white illustrations. A 16 page appendix gives suggestions for further reading on each figure. The Historical Society of South Australia, PO Box 519, Kent Town, SA 5071. Please include a cheque, money order or credit card details with your order.